Instead of just designing another site, we constantly test and improve it by working with and learning from these top fitness marketing coaches. Their principles and advises are built right into our website and marketing platform. Using the proven marketing techniques we construct a razor sharp design tuned for a maximum result, which is why we are constantly testing and improving our sites to help you differentiate your brand. Why is it that successful trainers are able to seamlessly convert such a high percentage of average leads to paying clients? With our host of powerful conversion tools at your fingertips you will have everything you need to achieve your own success. Our proven optimization method is designed to yield a high return on your investment. We handle all the complex and time-consuming SEO work for you. All websites are mobile friendly, SEO optimized and built to convert visitors to leads. Change graphics for free. 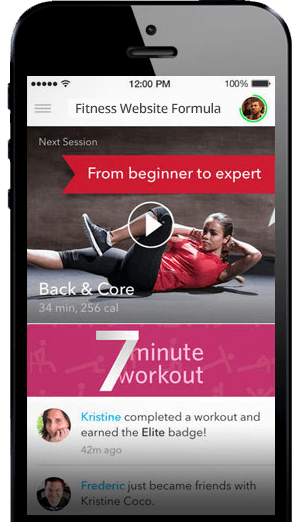 This latest theme is the most popular platform for group training. Clean and user-friendly layout, yet highly focused on traffic conversion. Features: Lead Capture. Shopping Cart. Responsive. We are the fitness web design and marketing experts for fitness and wellness professionals. We work with some of the most successful fitness entrepreneurs in the world building producing over 100 new websites consistently every year. Our skills range from designing high conversion websites, running local SEO for highly competitive keywords, to developing fitness software. Fitness Website Formula is a pioneer in creating effective web design solutions for fitness professionals. We have built 680 websites since 2008 and have consistently upheld an unwavering track record of successful websites and excellent customer support. Our sites feature seamless design layouts that incorporate cutting edge testimonial representation, search engine optimization, client retention mobile apps, and high traffic conversion like no other. These services provide our clients with impressive social proof and a constant stream of new leads. The main goal of Fitness Website Formula is to take the burden of online marketing away, so that fitness professionals can focus on what is most important: working with their clients and helping them achieve results. Our services provide you with a stronger online presence than your competitors and maintain that upper hand by continually improving and creating new services. The leads captured with our sites will be more qualified than other sites that are under-optimized or just too generic. We provide the tools to create a seamlessly cohesive online presence that attracts new clients, keeps current clients engaged and significantly decreases the amount of time and hassle spent on online marketing. “By far the best business decision I have made. I got a few hundred new leads in a little over 3 months. Partner with us in making website and marketing improvements. We’ll monitor your performance and make sure your website is in top form. You can stop pulling your hair trying to format your content. With our visual editor features, adding and modifying content is easy and intuitive. More than half of internet users prefer to use mobile devices. We optimize your site to generate leads from phones and tablets. Due to the fast paced nature of technology, we upgrade your website platform to a better, more effective system every year. We also refresh your graphics to keep you relevant. Don’t just settle for having the social media pages. Attract more eyes and prospects to your site with our social media tactics. Rank higher on Google and get more traffic with our SEO toolkit. We will also provide all the resources you need to start doing successful SEO on your own. Manage all your client’s testimonials in one place with this submission feature. It allows clients to send in their own videos. Monitor your client’s progress with our online tracking tool. Clients can log their results online and track their body measurements so that you don’t have to. This tool is great for weight loss and transformation challenges. Capture prospect information directly from your website to Zen Planner, creating a seamless integration. Advanced lead tracking allows you to know where your leads are coming from and what marketing methods are working the best for your business. Stop sacrificing time with your clients to think up fresh content for your newsletters. FitPro will create content on your behalf and send it out to your clients so you don’t have to. Streamline the signup process for you and your clients with this feature. Potential clients can conveniently sign up for services directly to your site. In addition to the Pro Plan features, the Elite Plan includes the Fit Meal Formula mobile app, an online coaching platform, marketing funnels, and custom monthly blog posts. This plan is perfect for a business that wants to take their marketing to the next level as well as offer more online coaching options to their clients. This app takes online training to the next level with customized meal plans, grocery lists, and nutrition tracking. Watch your clients transform their bodies as they learn to eat right and complete your workout plan. Our online nutrition and training membership platform enables your clients to access videos, meal plans, body measurements, and more. Easy for you to manage content and sell memberships. Save yourself time thinking up new content. Get unique blog posts and one newsletter each month that are keyword optimized and pinged. In addition to the Elite Plan and Pro Plan features, our Master Plan includes SEO and PPC (pay-per-click) campaigns. This plan is essential for any business looking to use the best marketing and business management tools available to create lasting results that will transform any company. New Website, Mobile App and Webmaster Support Included. Free Annual Upgrades. Unparalleled Support – Get The Ultimate Online Marketing Platform!